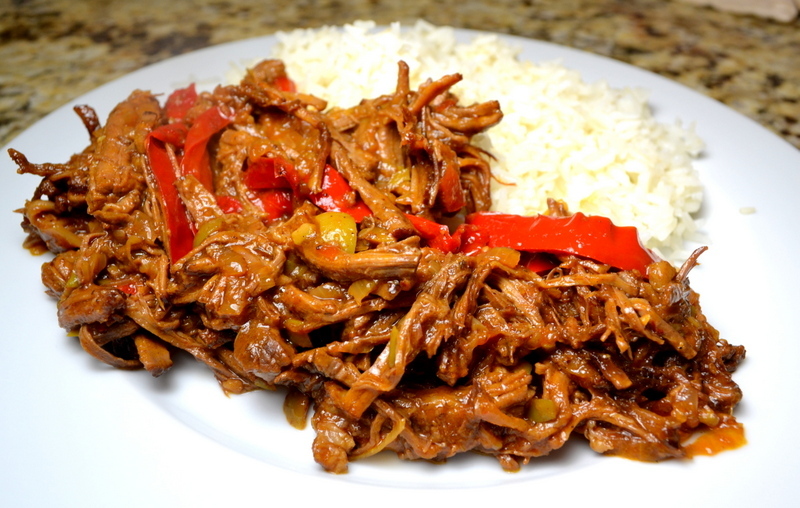 I’ve made one of Chris Kimball’s older recipe for Ropa Vieja which used a slow-cooker, but today’s recipe uses a more traditional technique of browning the beef and cooking for 2 hours in the oven. It was much more flavorful and is a definite improvement over the older recipe. The recipe calls for brisket, which naturally has a very distinctive grain that lends itself perfectly towards shredding. The recipe was very well seasoned, though not at all “hot”. Next time I may add a Jalapeno or two. Overall, a delicious recipe; 4-stars. In my experience Ropa Vieja is always served with white rice, but Chris Kimball has a recipe for beans and rice here. Started: 2:00 pm Ready: 6:00 pm. Set a rack to lower/middle of your oven and pre-heat oven to 300 degrees. Trim the fat on your brisket down to 1/4-inch. Slice the brisket against the grain into 2″-wide strips. The precise length isn’t that important, but cut any strips that are longer than 5″ in half to reduce their length. Pat beef dry using paper towels and season all sides with salt and pepper. Set a Dutch Oven over medium-high burner and pre-heat 4 tablespoons (1/4-cup) vegetable oil until it just begins to smoke. Brown all sides of the beef for a total of 8 to 10 minutes. Remove to a large plate at set aside until Step 7. While the meat browns, prepare the vegetables by slicing the onions in half, peel and sliced thin. Remove the stem and seeds from your bell peppers, and slice into 1/4″-wide strips. When the pot is empty, add the onions and bell peppers and cook for 10 to 15 minutes until the pan bottom develops a fond. Empty the vegetables to bowl and set aside. While the onions and peppers cook, rinse your anchovies, pat them dry using paper towels and mince. Also peel and mince your garlic. Add 1 more tablespoon oil to now-empty pot, Add minced anchovies, garlic, cumin, and oregano and cook for 30 seconds until they become fragrant. Stir in wine, and de-glaze the bottom of the pan. Cook for 1 minute until mostly evaporated. Add broth, tomato sauce, and bay leaves. Return beef and any accumulated juices to pot and bring up to a simmer over high burner. Move pot to 300-degree oven and cook, covered, for 2 to 2-1/4 hours until the beef is just tender; flipping meat after 1 hour. Remove beef to cutting board and allow to cool for 10 minutes until cool enough to handle. Pull apart into 1/4″-thick pieces. Fish out bay leaves from pot and discard. Chop olives and add to pot along with the onions/peppers reserved in Step 4. Bring up to a boil over medium-high burner and allow to thicken for 5 minutes. Mix in the shredded beef and add vinegar. Adjust seasoning with salt and pepper according to your taste. 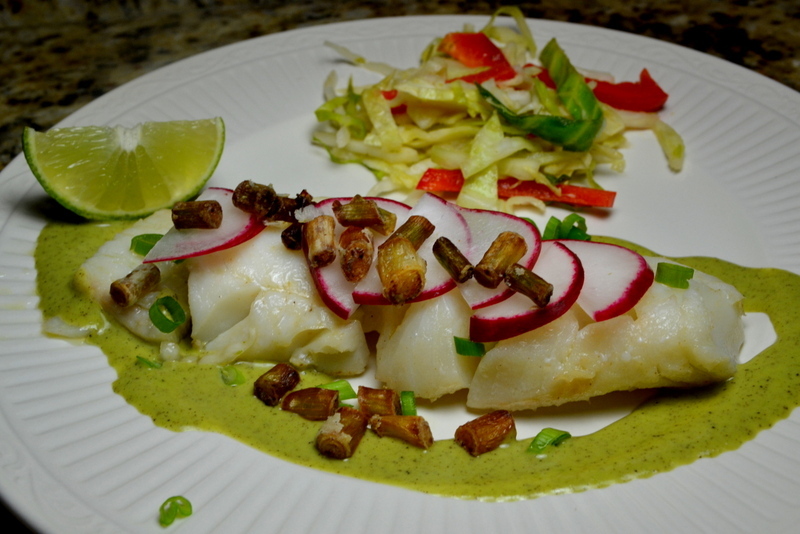 A few years ago I made this latin 5-star poached cod, and today tried an Asian variation. As before, the fish was perfectly cooked; moist and tender. The flavors were balanced, but the flavors were more subtle than the previous Latin variation. I simply added more sauce to my plate, and it worked out great. It did take me quite a while for me to find the white miso paste required for this recipe (which turns out to be in the refrigerated Asian section). I ended up going to an Asian supermarket. Overall, a delicious 4-star meal; but not as good as the 5-star Latin version. In Chris Kimball’s original recipe, he says to let the oil cool down to 180-degrees. Today I cooked the scallions for 4 minutes and had to wait about 5 minutes for the oil to cool down. When I made the Latin-themed version and I fried the jalapenos for only 2 minutes, I had to heat up the oil in step 5 instead of allow it to cool. Trying to find a flaky white fish that is a consistent 1″ thick is difficult. The thinner parts were almost as delicious, even if there were slightly over-cooked. Started: 5:00 pm Ready: 6:00 pm. 4 skinless white fish fillets about 1″-thick. Set a rack to both the middle and the lower-middle of your oven, and pre-heat to 250-degrees. Cut your fish into 6-oz pieces and pat dry using paper towels. Sprinkle each fillet with 1/4 teaspoon kosher salt. Allow to sit at room temperature for 20 minutes before cooking. Meanwhile, Slice the scallions whites into 1/4″ slices. Dredge your scallion whites in corn starch. Cut your onion if half, peel one half and save the second half for another day. Set a 10″ non-stick skillet over medium burner. Add 1/2 cup oil and pre-heat until shimmering. Fry scallion whites for 3 to 4 minutes until crisp. Pour the contends of the skillet through a fine-mesh strainer into a Pyrex measuring cup. Remove fried scallions to paper towel–lined Pyrex pie plate or casserole dish. Sprinkle with a little kosher salt. No need to wash the strainer yet. Increase amount of oil in measuring cup so that you have 3/4 cup, and pour back into the skillet (but off the heat). Put the onion cut-side-down in the center of the skillet. Allow the oil to cool to 180-degrees, which could take between zero and 8 minutes. Place fish with skin-side-up in oil, which should rise to cover about half-way up the fillets. Spoon a little oil over each piece of fish, cover your pan, and place on middle rack and cook for 15 minutes at 250-degrees. Remove covered skillet from oven and flip fish using two spatulas. Replace lid onto skillet and place on middle rack and continue to cook for 10 minutes longer until the internal temperature of the fish reaches 135-degrees. After 5 minutes of cooking put the fried scallions on the lower-middle oven rack to warm them through. When fish reaches desired temperature, place on serving platter and tent with aluminum foil. Add 1/2 cup of the olive oil used to cook the fish to blender. Blend for 1 minute on high-speed. Add any juices from fish that have accumulated to blender, adjust salt according to your taste. Blend for 10 more seconds on high-speed. Run vinaigrette through fine-mesh strainer and use a rubber spatula to press solids down to extract as much vinaigrette as possible. Place each fish fillet on individual serving place and top with fried scallions, radish slices and sprinkle with thinly sliced scallion greens. Drizzle vinaigrette around each individual piece of fish (not on-top). Serve remaining vinaigrette separately. For me a big Sunday dinner has become an important part of my life (a tradition I adopted during my year living in Buenos Aires), and I always pull out all the stops. So it was with much anticipation that I shopped for the ingredients for this Mu Shu Pork. Unfortunately, the recipe was a huge disappointment. When cooking the pork in Step 6, the pork was too wet and just steamed; not caramelizing at all. Overall this Mu Shu Pork was bland. None of the ingredients brought much flavor; tenderloin, cabbage, bamboo shoot are all very mild. While not bad; it simply lacked flavor to set it apart. Just 3-stars; and not worth the 2 hours of preparation. 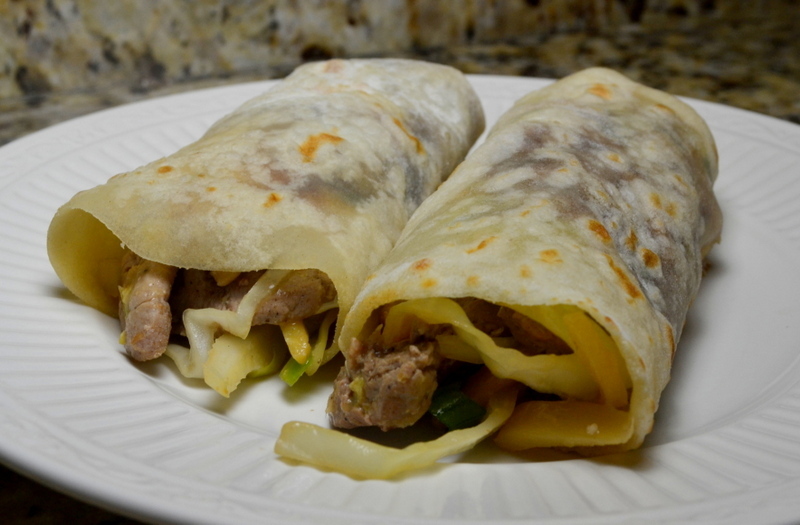 While the pancakes took a full hour to prepare, Chris Kimball warns against using tortillas. Because this was my first time making this recipe, I didn’t realize that I should have started the prep while making pancakes. It’s best to use that half hour at the end of Step 2 to prepare the meat, cabbage and bamboo shoots. When first cooking the pork in Step 6, the pork was both too wet and the pans was too crowded. The pork steamed instead of browning; even after cooking for longer than the 2 minute maximum called for in the recipe. Start time: 4 PM. Finish time: 6:10 PM. Put a small pot with about 1 cup of water over high burner and bring to a boil (you will late measure out 3/4 cup of water). To make the pancakes, weight flour in a medium bowl, add boiling water and mix using a wooden spoon until forms a rough dough. Allow to cool then empty onto a lightly floured counter and knead for about 4 minutes until the ball is tacky, but no longer sticky. The dough does not need to be completely smooth. Use plastic wrap to loosely cover and allow to sit for 30 minutes. (Meanwhile you can to the prep work under Stir Fry, Step 2). Lightly flour your surface and use your hands to roll out dough into 12″ log. Cut into 12 equal-sized pieces. Arrange so that the cut side is up and pat into 3″ disks. Brush one side of 6 disks with toasted sesame oil, and set one of the un-oiled disks on-top of the oiled-side. Lightly press down to form 6 pairs. Lightly flour the counter and use a rolling-pin to form 7″ disks. Add 1/2 teaspoon vegetable oil to 12″ non-stick skillet. Set over medium burner and pre-heat until the oil is shimmering. Wipe out with a paper towel, and cook one pancake at a time without moving for 40 to 60 seconds per side; until air pocket begins to form between the two layers and a few light brown spots appear of the second side. Remove pancake from skillet and allow to cool on a plate until cool enough to handle, then peel the two pancakes apart. Stack pancakes with the moist-side-upward and loosely cover using plastic wrap. Repeat with remaining pancakes. If you are going to use them today, cover pancakes tightly with aluminum foil to keep them warm. If you are using them another day, you should wrap them tightly in plastic wrap, and then with aluminum foil. They can be refrigerated for 3 days or frozen for 2 months. You should thaw the wrapped pancakes at room temperature, when unwrap and set on a plate. Cover with a second, inverted plate and microwave for 60 to 90 seconds until warm and soft. Rinse the shittake mushrooms, and put into a small bowl (or two cup Pyrex measuring cup); cover tightly with plastic wrap. Microwave for 1 minutes until steaming. Allow to soften for 5 minutes, before draining through a fine-mesh strainer, reserving 1/3 cup of the liquid. Trim away and discard the stems, and slice the caps thinly. Meanwhile, trim away the silver-skin from the tenderloin and slice in half horizontally. Slice each half thinly against the grain of the meat. Thinly slice your scallions, keeping the white and green parts separate. Rinse your bamboo shoots under the tap, the slice them into match sticks. Thinly slice 3 cups of cabbage. In a large bowl, add 2 tablespoons soy sauce, 1 tablespoon sherry, 1 teaspoon sugar, 1 teaspoon ginger, and 1/4 teaspoon pepper. Add the thinly sliced pork and toss together until evenly combined. In a separate small bowl, whisk together the 1/3 cup mushroom liquid, 2 more tablespoons soy sauce, 1 more tablespoon sherry, and 2 teaspoons cornstarch; setting aside. Wipe out skillet from pancakes with paper towel. Set over medium-high burner and pre-heat 2 teaspoons vegetable oil. Beat together the two eggs, and quickly scramble for 15 seconds until set (but not until dry). Empty eggs to serving bowl and use a fork to break into 1/4″-to-1/2″ pieces. Put the skillet back over medium-high burner and pre-heat 1 tablespoon vegetable oil until it begins to shimmer. Saute scallion whites for 1 to 1-2/12 minutes until evenly browned. Add the pork mixture and spread into an even layer. Allow to cook without moving for 1 to 2 minutes until well browned. Site and continue to cook and stir for 1 to 2 minutes until all the pork is opaque. Empty into serving bowl with eggs. Return now-empty skillet to medium-high heat and heat remaining 1 tablespoon oil until shimmering. Whisk mushroom liquid mixture to recombine. Add mushrooms and bamboo shoots to skillet and cook, stirring frequently, until heated through, about 1 minute. Add cabbage, all but 2 tablespoons scallion greens, and mushroom liquid mixture and cook, stirring constantly, until liquid has evaporated and cabbage is wilted but retains some crunch, 2 to 3 minutes. Add pork and eggs and stir to combine. Transfer to platter and top with scallion greens. Spread about 1/2 teaspoon hoisin in center of each warm pancake. Spoon stir-fry over hoisin and serve. It’s early March and I’m feeling that I’ve allowed circumstances to permit the stew-making season to slip by. So I used this “snow day” to cook today’s recipe as I work from home. Throughout the day the wonderful aromas filled my house and made everybody’s mode much better. While Chris Kimball calls this recipe for Peposo a “Tuscan-style beef stew”, the end result was not so much like a stew. A better description would be wine-braised beef (with lots of peppercorn and garlic). The sauce was too thin to be a stew, and there were no vegetables. Overall, the meal was very good. My sons and I enjoyed the beef. While it was delicious, still I feel it falls significantly short when compared to other stews. 4-stars. Chris Kimball’s main trick in this recipe is; instead of adding all the wine at the beginning; to add it at 3 points during the cooking process. This is supposed to boost the fresh wine flavor. I am not sure if this was one of the contributing factor to the overly runny-sauce. The recipe calls for boneless beef short ribs, which add about $5 to the cost of the recipe when compared to a chuck roast. However, my butcher prepares all his boneless ribs from the chuck, so there is no difference in flavor. The main advantage is that it makes for easier preparation and more consistent cube size. But as I was looking for the specific pieces of meat to buy, I saw that the butcher just cut the meat into cubes regardless of the large veins of hardened fat running through the middle of the cubes. I knew that fat would never break down. I ended up with a 5-pound chuck roast with took an extra 15 minutes to cut into cubes. 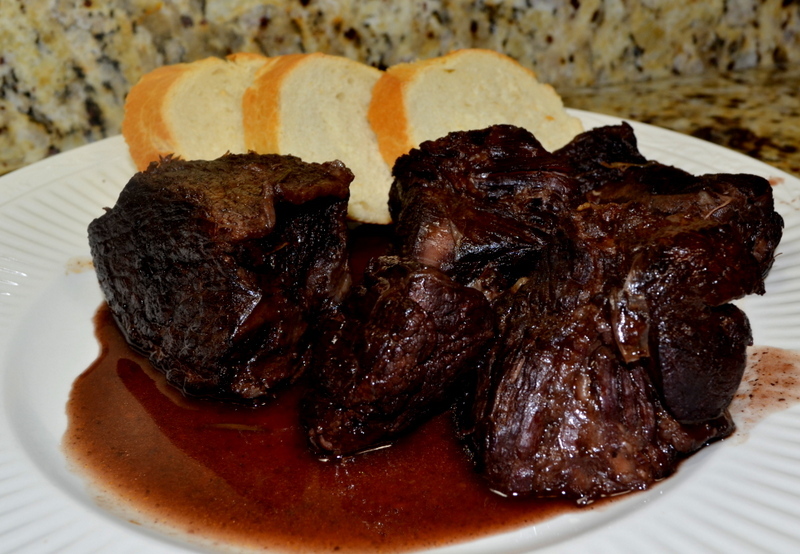 As I mentioned above, the recipe calls for boneless short ribs. Chris Kimball also mentions my substitute of a 5-lb chuck roast. I am not sure if I cut away a full pound of fat and sinew; maybe more like half pound. 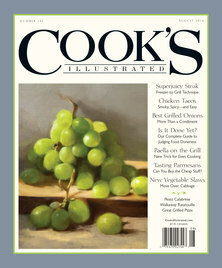 Cook’s illustrated tried a variety of wine at various price points. They conclude that a $5 to $12 Chianti works best, but you could also substitute and inexpensive Côtes du Rhône or Pinot Noir. Start time: 1:45 PM. Finish time: 6:00 PM. Trimmed the short ribs, and cut into 2″-pieces. Add the beef to a bowl, and toss to combine with 1-1/2 teaspoons of salt. Allow to sit at room temperature for 30 minutes. set a rack to the lower-middle of your oven. Pre-heat oven to 300-degrees. Set a large Dutch oven over medium-high burner. Add 1 Tablespoon of vegetable oil and pre-heat until the oil just begins to smoke. Brown the beef on all sides in two batches; a total of 8 minutes per batch. Adjust the burner as necessary to prevent the fond from burning. Remove first batch to a clean plate and repeat browning with second batch. While the beef cooks peel your 4 shallots and cut in half length-wise. Peel your 2 carrots, again cutting in half length-wise. Separate the cloves of your head of garlic (do not peel) and crush the cloves. Add 1-1/2 tablespoons peppercorns to a plastic bag and crush using bottom of a skillet (only 1 tablespoon of which is added to the pot in step 4). Add together 2 cups of wine, 1 cup water, shallots, carrots, garlic, 4 sprigs rosemary, 2 bay leaves, 1 tablespoon cracked peppercorns, 1 tablespoon gelatin, 1 tablespoon tomato paste, 1 teaspoon anchovy paste. Add back the beef from the first batch. Bring the pot up to a simmer, cover tightly with heavy-duty aluminum foil, and the lid of Dutch oven. Move to 300-degree oven and cook for 2 to 2-1/4 hours, stirring after 1 hour. The beef will be ready when it is tender. Use a slotted spoon to remove the pieces of beef to a serving bowl, and lightly cover with aluminum foil, setting aside until Step 9. Strain what remains in the pot through a fine-mesh strainer into a fat separator. Allow the liquid to settle for 5 minutes. Use paper towels to wipe of the pot, and return the de-fatted juices back to the Dutch oven. Turn on burner to medium-high, add 1 additional cup of wine and 2 teaspoons of ground black pepper. Reduce burner to as to maintain a brisk simmer for 12 to 15 minutes, stirring occasionally, until the sauce thickens to the consistency of heavy cream. Reduce burner to medium-low. In a small bowl, combine the remaining wine and 2 teaspoons of cornstarch, add to pot. 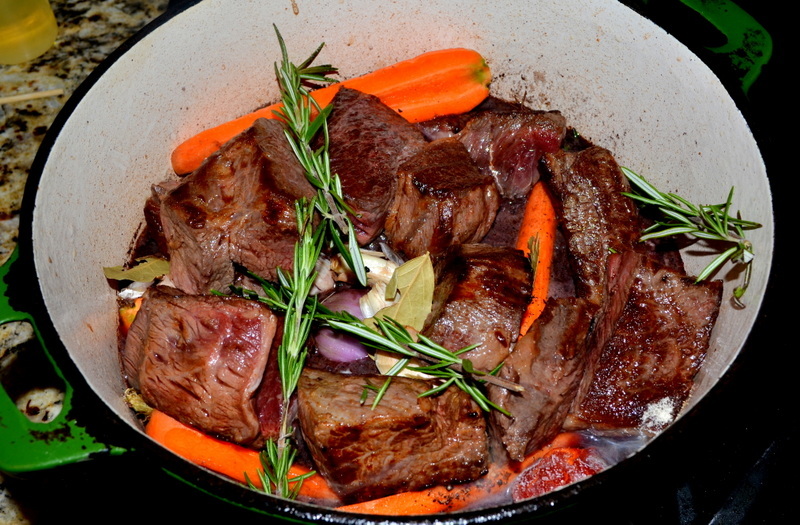 Return the beef to the pot, cover, and simmer for 5 to 8 minutes so as to heat the beef. Adjust seasoning to salt according to taste. Serve, passing the extra cracked peppercorns separately. You are currently browsing the My Year Cooking with Chris Kimball blog archives for March, 2015.